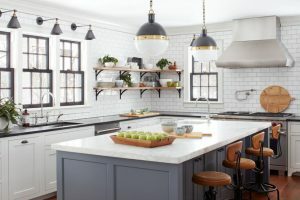 Last three kitchens I helped to remodel, the homeowners wanted subway tile backsplashes. It’s an awesome choice! It is so flexible…goes with a variety of cabinet styles, always classic (yet on trend! ), and makes a great backdrop for wood or other color accents. Especially when paired with gray grout, it’s amazing. My no-fail go-to!